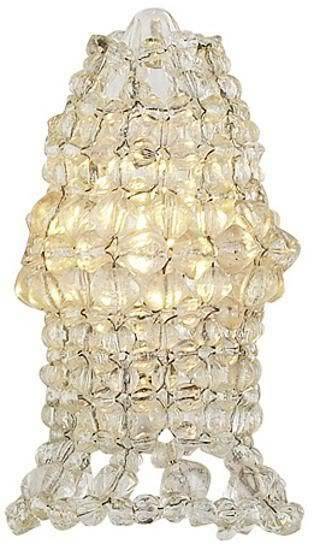 Wonderful Beaded Chandelier Bulb Cover in a sparkling clear crystal color. Lots of exquisite Glass Beads on wire, beads form a row of flower shapes in the middle, the cover ends in a flirty little "flounce." Decorative detail for your chandeliers or wall sconces, they look beautiful and also soften the light a little. We love the way these look on an antique French Lamp, Sconce, or Chandelier, when the light is on - this little beaded shade makes it look like a sparkling GEM! Shipped as they are in stock, these may take 1-2 weeks to ship if out of stock. Made to order just for you, not returnable.